The Western Bulldogs and North Melbourne Football Clubs are running a Junior Footy Registration competition. Any participant that registers in Auskick/Junior/Youth (Under-8 through to Under-18.5) Football in the WRFL prior to January 14 will be in the running to win two great prizes. 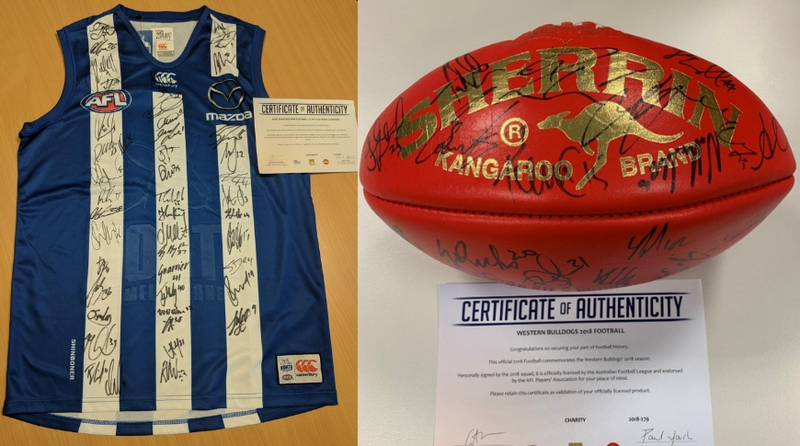 You could win a 2018 AFL Footy signed by the entire Western Bulldogs team or if you are a Wyndham based player you will go into the draw to win a 2018 signed North Melbourne jumper. So make sure you Register now! Participants registered for WRFL Clubs are only eligible. Western Bulldogs affiliated Club participants will be eligible for the Western Bulldogs prize, North Melbourne affiliated participants (Hobsons Bay/Wyndham) will be eligible for a North Melbourne Prize. Participants will need to be registered prior to 12:00pm Monday January 14th. Prize will be drawn on Wednesday January 16th at 10:00am.